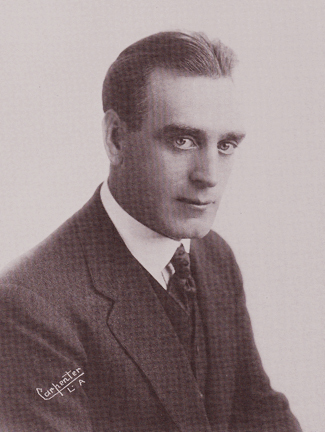 Alfred Paget was born in London, England June 2, 1879, and he appeared in 244 films between 1908 and 1918. He entered military school when he was 16 "where his aptitude in riding placed him in the cavalary." He served in South Africa in the Royal Horse Guard of the British Army and received the Queen's South Africa Medal. He came to the United States, and after a short time on the stage, entered the movies with D.W. Griffith at the old Biograph studios in New York in 1908 appearing in many of Griffith's earliest films for the studio. Almost all of his 11-year career was spent with Griffith appearing in many of his most famous shorts, as well as portraying King Belshazzar in the epic "Intolerance" (1916). He continued to appear in Triangle-Fine Arts Productions during his last few years, but not necessarily under the directorial supervision of Griffith. It appears that his first film away from the Griffith sphere was "Big Timber" (1917) which starred Kathlyn Williams and Wallace Reid and was produced by the Oliver Morosco Photoplay Company. He also appeared in three Fox features, "Aladdin and His Wonderful Lamp" (1917) with Frances Carpenter and Virginia Lee Corbin, a Tom Mix feature, "Cupid's Roundup" (1918), and "The Girl With the Champagne Eyes" (1918) with Jewel Carmen. For whatever reason, his last film, "When A Girl Loves" (1919) for Lois Weber Productions, wasn't released until 1919, several months after he had left Hollywood. In April 1918, he enrolled in the Canadian Expeditornary Force and was assigned to the 34th Fort Garry Horse Depot Squadron in Winnipeg as an instructor. His premature death is reported in an October 16, 1919, article in the San Bernardino County (CA) Sun newspaper, "Mr. Page was a native of London, England, and a year ago last April enlisted with the Canadian forces in Los Angeles, being sent to Winnipeg and enrolled in the Fort Garry Horse (Regiment), where previous experience in the English Calvary in the Boer War, in which he participated when a mere youth, made his services particularly valuable as an instructor. It was this same value which held him in the barracks at Winnipeg when he longed to be overseas in action." The article goes on to say, "During the summer he contracted a form of malarial fever, and while convalescent took pneumonia, which became serious because of a heart complication . . ." Paget passed away at the Manitoba Military Hospital in Winnipeg, Canada, on October 9, 1919. He was survived by his wife, Leila Halstead Paget.